NO Parking Loading and Unloading Zone Signs - 12x18 - Reflective Rust-Free Heavy Gauge Aluminum. 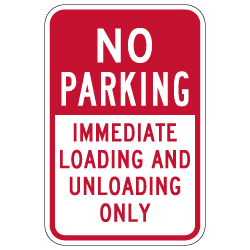 Clear your loading zone of parked and idle vehicles with our NO Parking Immediate Loading And Unloading Only Signs. This split sign with red NO PARKING header and bottom red text is a great way to get the attention of all nearby drivers.